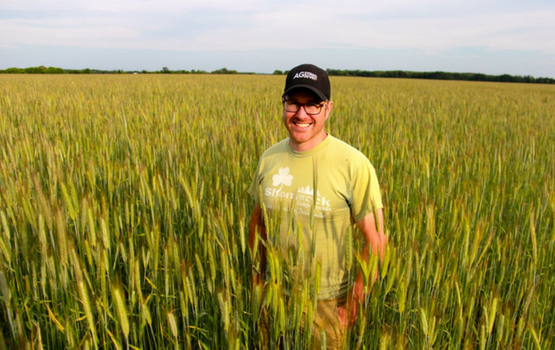 I work for a conservation agency and operate a small grain farm north-west of Winnipeg near Rosser, MB. I finished transitioning last year and my first organic crop will be in 2016. Although I didn’t grow up on a farm, I grew up helping neighbors out. I did an agriculture degree, with a focus on plants and soil at the University of Manitoba and I have since bought a little bit of land. What was the biggest success on your farm in the last year? I guess probably the season long green manure we grew last year. It seemed to work fairly well, we’ll be doing a soil test to really figure out but in terms of bio mass produced and weed control and looked very good. The green manure was done in a two stage field. First, in early June, I planted faba bean, soy, pea, oat, radish mix, then worked it under after 7 weeks. I re-seeded a pea, oat, sunflower and radish mix as a catch crop which was eventually winter killed. Being on smaller acreage, it made sense to me. I always leaned a bit that way. It was more feasible for me to work this way to make a living. I work full time, and I am hoping that one day farming can be all that I do. So far marketing transitioning crops has been tough for sure. But otherwise it hasn’t been bad at all. The biggest costs have been increased equipment cost for weed control and the costs of green manure. Record keeping has not been that big of a deal. I grew hemp as part of the transition and will be my first year organic crop. I have another field in transition with fall rye, and I am looking at seeding winter wheat. In the future, I’ll likely look at soy beans, flax and continue working on green manure ideas. Everyone warns you about the decrease yields at same time seeing low, conventional prices during the transition period. I found yields were down, but not down so much to be an issue. At the same time the decrease in input costs during transition, have helped to minimize the financial penalties of the lost yield. Stumbling to find a better market for some of the transitional crops (i.e. pesticide free production). Probably I would say its a narrow space seed drill. One strategy I’ve been using for crop competition is high seeding rates and I will probably continue to do so. I bought a tine weeder, and lemken high speed disc for incorporating cover crop. I also got a roller crimper and a narrow row planter to go behind the roller crimper for soy beans. There are always more things that I want to buy but I can make do. A chaff collector is on my wish list. Dr. Martin Entz and his grad students at the University of Manitoba have been helpful. I’ve been quite involved with a number of the people in the faculty. Not a lot of neighbors close by are going through the same type of stuff. It would be nice if I had a few more neighbors nearby, which would help to decrease equipment costs and to share information with. Managing Cover Crops Profitably from SARE was helpful. I did some reading on no-till which pushed me towards the roller crimper. I am trying not to do a whole pile of tillage. I like to have a good plan. As well, I like to have some “rules” written out for helping to make some decisions like crop rotation. An example is flax will always follow plow down or a cereal. Writing observations of previous crops, thoughts about weed and disease pressure, nutrient needs, etc. helps me to make more informed changes when needed that make sense. The big thing is to be flexible in what your plan is. You don’t have as many tools available to deal with some problems, so if you’ve got weeds coming up before your crop, the best thing to do might be to work under and reseed. Being open to different ways to deal with problems is an asset. You have to be a little more on the ball at certain times of year, while at the same time, I think there is some flexibility later on in the season than you might have in a conventional system.